In the automotive industry, quality and reliability are of the utmost importance. We are therefore proud of the fact that our production site in the Czech Republic once again passed its certification with flying colours in April of 2017. After a strict audit by TÜV Rheinland Cert GmbH, our ISO/TS 16949 certification has been renewed. This certification demonstrates that we manage our processes well, offer a high level of product quality and continuously work to improve ourselves even further. In order to earn and keep their certification, organisations have to meet strict international requirements. Traceability, for example, is an important aspect. If something goes wrong with a product during the usage phase, the process behind this product must be fully traceable; from the origin of the materials used to the procedures that were followed. This means we have to operate in an extremely accurate manner, in accordance with strict procedures, and carefully document every step of the process. We also conduct audits among our suppliers, who preferably employ the same standards and methods that we do. This guarantees we only work with reliable partners. Another criterion we were audited on is quality. We can only deliver an automotive product once it has been fully approved by the customer. The ISO/TS has an extensive procedure that covers the entire process of product approval. 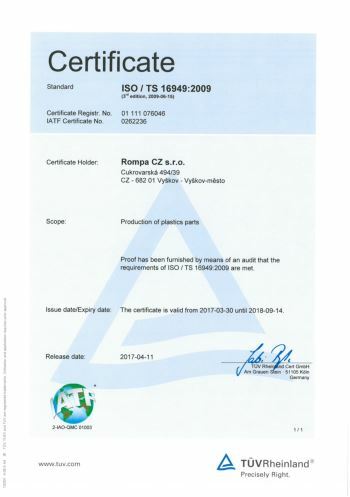 This certification proves that our products meet these quality requirements. Our customers often choose to conduct their own audits at Rompa as well, for extra assurance or because of unusual procedures. The ISO/TS certification is valid for one year – not two, as was common in the past. This is due to the fact that the ISO/TS will be replaced by a new quality standard: the IATF 16949. Before September of 2018, all certified organisations must transition to this new standard. Rompa CZ’s Quality Manager will ensure that all our procedures are updated in accordance with the new requirements and that the transition from ISO/TS to IATF proceeds without a hitch. 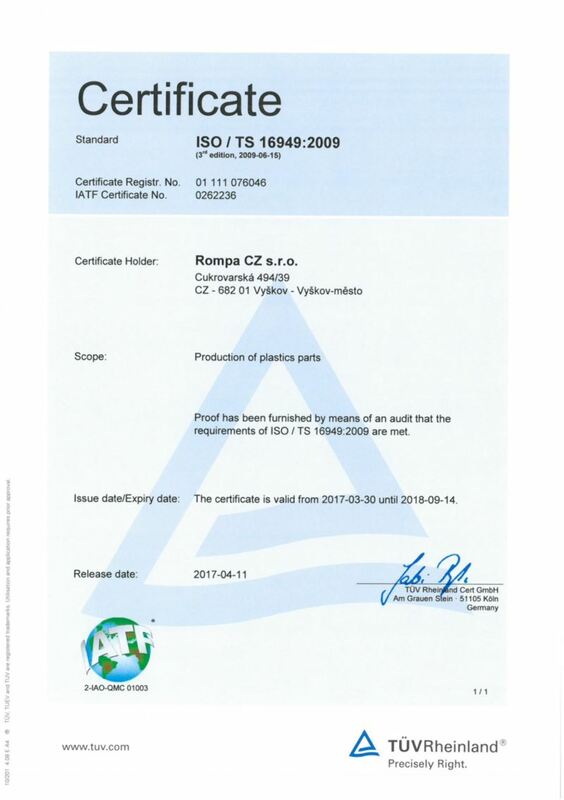 In addition to the ISO/TS certification, our ISO 9001 certification was also renewed. This means that we also meet the requirements of this international quality standard, in addition to the specific requirements for the automotive industry.